We are delighted that three varieties; GERANIUM pratense ‘Yorkshire Queen’, GERANIUM phaeum ‘Stillingfleet Ghost’ and GERANIUM x oxonianum ‘Stillingfleet Keira’ were originally grown from seedlings in our garden. 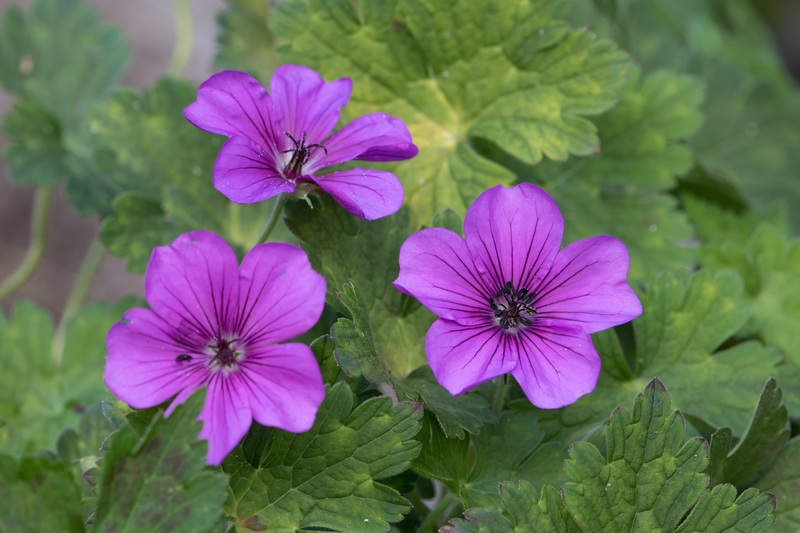 New hardy geraniums for 2019 include sun-lovers GERANIUM cinereum ‘Jolly Jewel Salmon’, GERANIUM cinereum ‘Jolly Jewel Silver’ and GERANIUM cinereum ‘Jolly Jewel Red’ . White pea flowers in loose spikes in summer. Good pinnate foliage. (Sweet woodruff) Creeping, with white fragrant flowers in May. Good in shade. From a clump of foliage this sends out long stems ending in magenta flowers with a black eye. It is a cross between G. procurrens and G. psilostemon. A spot of “Rozanne” but more compact. Pale blue flowers from summer to early frosts. Large violet-blue flowers. Finely cut foliage. Very deep blue flowers with reddish markings. Flowering in mid-summer. A Marco van Noordt introduction. Masses of starry blue flowers, the name is very apt. Lilac, soft blue flowers with deeper veining at the base of the petals. A seedling from G. ‘Brookside’. Greyish foliage. Yellow fringe in the spring. Large blue flowers in early summer. (G.pratense x G.clarkei ‘Kashmir Purple’) I thought this was exactly like G. ‘Johnson’s Blue’ when I first grew it, actually it is a much better plant, flowering from May to November with bowl-shaped blue flowers. Makes a dense mat of fragrant leaves. Flowers pinky- mauve for a long period. A cross between G. macrorrhizum and G. dalmaticum. Evergreen with pale pink flowers. Cerise flowers in early summer. Fragrant evergreen foliage turning reddish brown in winter. A mat of bright green evergreen foliage and pale pink, almost white flowers in summer. Excellent ground cover. Small with large bright pink flowers. Long flowering. Needs sun. Finely cut leaves and bowl shaped flowers of a beautiful soft pink. Not as vigorous as G. ‘Kashmir Purple’. Very daintily cut leaves, purple flowers in summer. Runs gently. Warm white veined with purple giving a grayish effect. Early summer. Mounds of dark brown foliage and largish pale pink flowers, needs good drainage and sun. Lots of large deep pink flowers, the petals edged with white. Large blue flowers in summer. Green foliage turns reddish in autumn. Sport of ‘Orion’ from Brian Krabbes. Salmon-pink small flowers in June. Light green leaves. Marbled foliage, pink flowers in late summer. Sprawling. Large white flowers with darker veining. This form has larger blue flowers and is more compact. Large cup shaped flowers of pale blue throughout the summer. Spreading. Divided leaves which colour in the autumn. Blue flowers. Tends to flop. Beautiful pale pink, bowl shaped flowers in late summer. Makes a mound of foliage topped with masses of flowers. Large bright pinkish-purple flowers in late summer. Best in some shade and not too dry conditions. The foliage of this species disappears in the summer and appears the following autumn. Violet‐blue flowers. Pale lilac flowers veined with purple in late summer. A sport of Rozanne and just as good. Excellent evergreen groundcover, green fragrant foliage, soft pink flowers. Small glossy leaves. Reddish purple flowers. Low growing vigorous form with pure white flowers. Not as vigorous as some. Round flowers of a luminous lilac in May. Rather like G. sylvaticum and flowering in May but the pure white flowers are slightly smaller. Dark brown foliage and bright pink flowers in summer. Hairy leaves which turn red in autumn. Blue flowers. Becoming dormant after flowering in May this has violet- blue flowers with darker veining on the petals. From a small clump of grey foliage this sends out trailing stems covered with clear pink flowers throughout the summer. Deep violet-purple starry flowers, very feathery foliage which is golden green in spring. Glossy lobed leaves, lilac flowers all summer. Will survive dense shade. Glossy maple-shaped leaves, purple flowers edged with white. Good in shade. Pure white flowers all summer. Will grow in dry shade. Excellent for dry shade. Pretty lilac flowers most of the summer. Large, bright blue flowers with darker veining. Pinky‐mauve flowers for most of the summer. If cut down after flowering will often flower again. G. endressii x versicolor. Very pale pink on spreading plants. This and ‘Rebecca Moss’ were given to me by Robin Moss who has named them after his children. The golden leaves are marked with dark blotches. Pale pink flowers. G. endressii x versicolor. Not quite as pale pink as ‘Kate Moss’. Narrow pale pink petals. Flowers throughout the summer and I have never had a seedling problem! Previously sold under the name G.’Stillingfleet’. We had not named it although it was one of our seedlings. This is the name we would like it to be called in future, named after our grand-daughter. It has small rosy-pink flowers. (G. endressii x G. psilostemon) Bright pink with a darker eye, flowering for months making this an excellent form. Reflexed white flowers. Good in shade. Pinkish lilac flowers in early summer. Another good shade plant. One of the best new variegated plants, creamy yellow veining on evergreen foliage. Purplish flowers in early summer. Does well in shade. One of our seedlings which was on trial with David Hibberd and named by him. Pale grey flowers of a reasonable size, a useful colour to add to the range of G. phaeum so good in shade. Grown for its wonderful leaves. Large dark-brown blotches in the centre of each leaf. Very good in shade. (G. renardii x G. polypetalum) Mounds of hairy grey leaves topped by purple flowers heavily veined. Large, deep red flowers with darker veining. A good new form. Bronze-purple foliage, large lavender‐purple flowers. Red stems, rose-pink flushed foliage and soft pink flowers in summer. Beautiful and easy. Grey flower flushed blue. Herbaceous. Dark purple foliage and white flowers with little pink veins. Needs sun. White flowers speckled with blue. Pale grey flowers, heavily veined. Named here. Magenta flowers with dark centres. Deeply cut foliage which colours in the autumn. A rare native with attractive rounded leaves and mauve- pink flowers for months. Can be short lived but usually self seeds. Delighted to have this Geranium from Robin Moss. Dark purple-red flowers with a small dark centre and dark veins. G.psilostemon x G.sylvaticum. Sage green circular leaves. White flowers veined with mauve in early summer. The usual sage-green leaves, lilac pink flowers. Strong growing clump of grey-green leaves and magenta flowers. (G. lambertii x G. procurrens) From a mound of foliage long stems support flowers of dusky-violet. Sprawling. Seedlings from ‘Cedric Morris’ a form with large magenta- pink flowers. Vigorous. Large white flowers for most of the summer. Another excellent plant from Coen Jansen. Bright pink flowers for most of the summer. A large flowered form with bright purple flowers throughout the summer. Makes a neat mound of carmine‐pink flowers. (Syn. G. sanguineum var. striatum) Pink flowers throughout the summer. Syn. ‘Leeds Variety’ Reddish flowers with dark veins. Flowers for a long time. (G. glacile x G. ibericum) Large purplish-pink flowers in mid-summer. Large clumps of bowl‐shaped deep purplish-blue flowers. (G. pelopnnesiacum x G. renardii) Large, pale blue flowers in spring. Good textured leaves make tight clumps. Lilac pink flowers with a dark magenta eye. Late summer. Pure white flowers in early spring. Deep blue flowers with a white eye and excellent foliage. Violet blue flowers in early summer. Purple-pink flowers for a long period on a vigorous plant. Deep-pink flowers veined darker pink. Sprawling. Grown from Himalayan seed. Large blue flowers with dark veins. Flowers from June to the frosts. Blue purple flowers with a white eye and pink veins. Late Summer. Marco van Noort introduction. A biennial, looking like a small G.palmatum. Large over- wintering rosettes of foliage, magenta flowers. Syn G.rubescens. Deeply cut leaves, saucer shaped pink flowers veined with darker pink. Bushy. Needs not too dry conditions. Lovely large semi-double pink flowers with frilly edges. Very pretty. Single orange flowers in early summer. Golden foliage and bright orange flowers make this a delight in the garden in early summer. Large semi-double golden yellow flowers. Wide open flowers with yellow petals. Brighter yellow than G. ‘Lemon Drops’. Clear yellow flowers with brown stamens. Good in early summer. Nodding greenish-white flowers in early summer. Tomato red flowers from early summer. A small flowered gladiolus with magenta flowers splashed with cream. Needs good drainage and fertile soil. The flowers are a strange mix of grey, green, cream and pinkish‐purple. It flowers in autumn, needs well drained soil and then spreads.